What better way to prepare for Ridley Scott's upcoming Prometheus than by watching what many consider to be the peak of the Alien series - James Cameron's sequel. Aliens is to Alien what Terminator 2 is to Terminator - bigger, better and more action packed. But it loses none of the tension of the original, the constant threat of the iconic creatures escalated from one to hundreds, the intensity knuckle-bitingly palpable. Fifty years after the events of the first film, Ripley awakens from frozen sleep and is sent with a team of navy grunts to investigate a human colony based on the alien homeworld. Of course, they walk into more than they bargained for. The colony seemingly deserted, the team discover not only the titular aliens but their queen and must escape whilst destroying the base. Over the course of the narrative, the soldiers turn from grunts to heroes we genuinely care about and the aliens are as terrifying as ever. Cameron's action sequences are expertly directed - as we've all come to expect. Sigourney Weaver's Ripley, though, is the star of the series. It's easy to take a feminist stance on the films with its central heroine, but Cameron certainly heightens these elements. 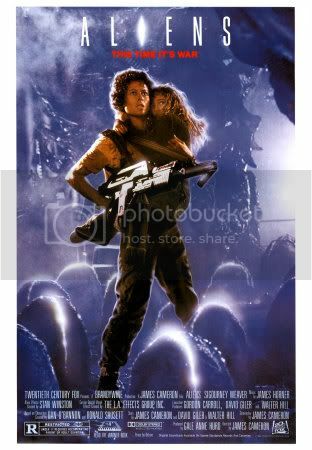 Aliens is essentially a film about motherly love. Her own daughter dead, Ripley becomes a surrogate mother to young surviver Newt and voluntarily becomes her protector. Likewise, the alien queen represents the future of her species, the film's climax involving her protecting her young. The parallels are clear, the feminist stance offering a twist on the science-fiction genre which has fuelled the appeal of the series. Not only this, but as one of Cameron's earliest films, Aliens (along with the first Terminator film) cemented him as one of the pre-eminent action film directors that paved the way for the Terminator sequel and, most recently, Avatar. And with both the re-release of Titanic and the release of Prometheus edging ever closer, there's no better time to catch up on this slice of cinematic history.